In which your narrator packs lots of boxes. 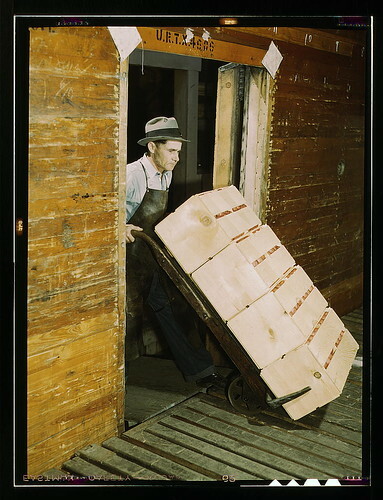 Jack Delano (FSA/OWI), “Loading oranges into refrigerator car at a co-op orange packing plant,” c. 1939. From the depths of my packing for relocation to Miami, I bring you some questions about the scholarly journal in the age of digital reading. As I go through my bookshelves, I’m confronting an amazing number of issues of scholarly journals that I subscribe to, in paper, and have never had time to read. Even though some of them offer online-only subscriptions, I’ve been partial to receiving the paper journals. There’s utility in an object: it hangs around my house/office, reminding me that I can find out about really fascinating new research if I just take the time to open the journal. But have I actually made time for reading them? Regrettably, no. Until one finds oneself packing boxes. What do you (personally) do with back issues of scholarly journals, now that you know that you’ll be able to find that article online? If you’re a member of a scholarly society that offers an online-only option for its journal, do you prefer that option? Why or why not? What do you (personally) do to keep up with newly published articles in your historical fields or areas of interest? What strategies do you use for making sure you don’t get behind? How do you (personally) take notes on your ongoing scholarly reading when you’re not doing it for a particular research project? I and my aching lower back thank you. Good luck with the move! After staying in the same office for fifteen years, I moved twice in three years, so I got used to letting go my paper journals. Now I keep two years of back issues for any paper journals I still receive. That gets me over any online embargo but, after that, they’re culled except for journals in which I have a publication! I subscribe to alerts for two dozen journals so I get an email when a new issue appears. Then I go to the table of contents, check what’s new and, if I find something that I want to read, I download a copy to my To Be Read folder (which syncs up with my ereader) and, more recently, I’ve added the citation to Zotero as soon as I see them. Between the two, I’m not only finding what I want and keeping track of the scholarship, but I’m getting articles read! I used to save them, now I chuck them once the embargo is over. I just don’t have the space. I moved 3,00 miles recently. I had a 15 boxes of files. These were mostly photocopies of “hard-to-find” articles and “obscure” books. I did some searching: 99% are now online. The books I had mostly bought in the meantime, save a few oddments. I recycled down to five boxes (which were letters and personal journals). And my introductory grad school books–the one everyone *must* have read–I donated. I read them. I know them. If I want to reference them, there are libraries and Google Books and Amazon Search Inside…. Everything you keep now? 95% you will discard later.